His backyard is an alien landscape where you might find a crashed spaceship. His garage is the nerve center for genetic experiments and sinister government conspiracies. He's independent filmmaker MIKE CONWAY, and the world is his soundstage. Director, screenwriter, actor, editor, composer--Mike does it all, with the help of a dedicated stock company of friends and family caught up in his infectious enthusiasm for making movies. And he does it with less money than most directors spend on coffee and doughnuts. I recently got Mike to stand still long enough to tell us a little about, among other things, the making of the sci-fi/horror thriller TERRARIUM (released by Lionsgate as WAR OF THE PLANETS) and his latest low-budget epic THE AWAKENING. porfle: What kind of home movies did you make when you were growing up, and how did this experience help you later on? MIKE: I made Super 8mm sound movies, which covered a lot of genres - horror, sci-fi, comedy, western, etc. The biggest help was learning how to achieve physical effects, by cutting away and editing certain shots together. You learn that you can achieve an awful lot, just through editing. For instance, a man changes into a werewolf, so you show his face with stubble, then cut to hair on his hand, then back to his face with even more fur on it. You can achieve gunshots, without needing squib effects. A simple shot of the shooter, then a closeup of the gun firing, then a shot of the victim grabbing his chest and falling. If you cut it right, you can imply anything. That carries over to future work. 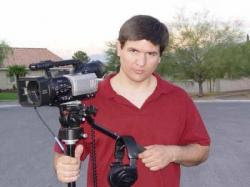 porfle: How did you first get into independent filmmaking? MIKE: Those Super 8mm shorts turn into 16mm shorts, which in turn flame the desire to do a whole feature. porfle: I haven't seen your first feature, THE BLACK CRYSTAL. I know from the trailer that it stars TERRARIUM's Lily Santoro ("Kim"), though her character here appears rather more, well, "wanton." What can you tell us about it? MIKE: I shot THE BLACK CRYSTAL as a Super 8mm feature. I transferred the film to broadcast video and then got picked up by Rae Don Entertainment. The movie got some U.S. and overseas release, back in 1991. Lili Santoro plays a witch in that movie, named Daphne. She has lost respect for most men and won't hesitate killing someone for crossing the line. It's not a very good movie, but the idea and characters are pretty good. I play the main character, Will Harper, who finds the Black Crystal (a power channeler) and falls for the witch. Unfortunately, her ex-lover, Daniel, is a powerful warlock. He will stop at nothing to get the Black Crystal. The fact that Will is lovenesting with Daphne is motivating him to do harm. porfle: Where did the idea for TERRARIUM come from? MIKE: TERRARIUM must be a good concept, because people keep asking me that. I took care of a friend's tarantula, for about 5 months. I would put crickets inside its terrarium and it would just let them crawl around. A week later, all of those crickets had been sucked dry. I imagined the crickets as people, so I made them into the astronauts of the movie. Nothing as twisted as real life, eh? porfle: What was it like designing and building a spaceship in your backyard? Is this where most of your $27,000 budget went? MIKE: $8,000 went into the 64' long, lifesize spaceship. Another 12K was for buying film, processing and transfer. Also in the budget was the 16mm camera and a Sony Vaio computer. That left 3K to buy uniforms, props, food and just make the movie. I designed it, kind of like you would a space station. Though it was a long fuselage, it was made up of 3 modules - the Storage module, the Cryo module and the Control module. I was thinking of an octagonal shape, with the angles of the ceiling, wall and floors. When it came to actually building it, my stepdad, Arley Steinbrink, framed it like a house. He also figured out a way to curve the outside shell, instead of the octagonal shape. Arley was the main builder, assisted by my then roommate, Paul Folger and myself. porfle: What was the reaction of your neighbors and city officials to this rather unusual structure? MIKE: Considering you could see it from a mile away, it's no wonder that the city ordered us to tear it down. The neighbors were pretty cool. They would come over and I would give them a tour of the ship. porfle: Like many independent filmmakers, you have a day job--you're a banquet waiter in a Las Vegas hotel. Did you cast TERRARIUM chiefly with coworkers? MIKE: Yes, our bartender, Tim Daley, played the captain. My supervisor, Jim Hendrickson, played Robert, the architect. Our Audio Visual tech, Jason Hall, played Leonard, the engineer, etc., etc. The other half of the cast was actually made up of actors from STAR TREK: THE EXPERIENCE, at the Hilton. I didn't have money to pay them, so it was all volunteer. So far, we have broke even on the costs. I'm hoping for a few more territory sales, so that I could actually pay something. porfle: Where did you film the press conference scene at the beginning of the movie? It obviously wasn't in your garage. MIKE: That was on the ballroom stage of the hotel that we work at. porfle: Speaking of your garage, which scenes in TERRARIUM were filmed there? MIKE: The alien lair, where the human autopsy was. porfle: What was it like filming the scenes in the spaceship's interior? MIKE: Usually, it was pretty hot, since it was August, in Nevada. I did have an airconditioner in there, but that was a big structure to try and cool down. The experience was pretty authentic, because the switches would light up and all of the cryochambers had their own lights. We had sliding doors. It was awesome. porfle: Your wife, Sheila, is perhaps the most talented actress in your stock company. Has she had any actual training in this area? MIKE: None. She is a natural. porfle: How did you manage to shoot around her very obvious pregnancy at the time? MIKE: We put her in a baggy cryosuit and flightsuit. I framed her from the chest up, or had her partially blocked by the other actors. For the sniper scenes, I dug a hole in the ground, big enough for her pregnant belly, so she could lay flat. porfle: You write and perform all the music in your movies, which I find very effective. Could you give us an idea of how this is done? MIKE: I have about a dozen synthesizers and samplers. I manage to get some huge layered sounds out of them. I'll come up with the themes and then lay tracks down with a sequencer. I tweak a lot of sounds to get the tone I want, for each movie. For example, I recorded a creaky, metal gate and transposed the pitch down. It sounds utterly eerie. porfle: Most of your cast seem to double as crewmembers in your movies. In fact, judging from the documentary A SPACESHIP IN THE BACKYARD, as soon as you say "Cut!" they break character and immediately join in the behind-the-camera-type duties. Do you find this to be a good way to work? MIKE: Some of the actors are fantastic about lending a hand. It's not the most effective way to work, though. I could really use a couple of production assistants and a director of photography. The problem comes from my work schedule. I don't get weekends off and the shooting is sporadic. It's hard to have a dedicated crewmember around, so that's why you see the actors jumping in. porfle: Are the gore effects and other SPFX a group effort as well? Or do you have an specialist in this area who handles such things? MIKE: Usually, I handle physical effects, like squibs, blood or Brandon's head exploding onto the terrarium glass. With THE AWAKENING, Kelly Johnston created a lot of gore with After Effects. For scenes, like Lara pulling the guy's heart out, Sheila gave us a raw chicken breast! Food is always effective. porfle: In hindsight, would you have done anything differently in the making of this film if you could? MIKE: Because the city ordered the ship to be torn down, we were under pressure to get it done, quickly. I really wish I could have spent more time lighting and moving the camera. In hindsight, I would have built a smaller, more concealed set. I would change the alien to something more reptilian. There's a lot that could be different and better. porfle: TERRARIUM had its premiere in a movie theater in Las Vegas. Can you tell us what this was like? Did you get the audience reaction you were hoping for? MIKE: The audience reaction was good. Of course, it was louder and bigger in a theater. There are a lot of atmospheric sounds that really come off well, in a surround environment like that. When you get a crowd of 200 people together, they tend to feed off of each other. When the monster tried to grab Leonard through the half open door, everyone jumped! They were even jumping at little scenes, like some of the false scares with the captain. porfle: How did you manage to get a deal with Lion's Gate to release TERRARIUM, and what led to the changes that were made in it before its DVD release, including the title change to WAR OF THE PLANETS? MIKE: The main changes were urged by a different distributor, Silver Nitrate. Their representative wanted something happening on the planet, right away. That's when I contacted FX man, David Rosler, about adding a spaceship crash. The poor guy only had a couple of weeks to pull off about 20 FX shots. Then, the rep from Silver Nitrate switched jobs to another company and they didn't end up buying it. I listened to a lot of suggestions and ended up cutting some key character scenes, as you saw in the TERRARIUM version. The whole backstory with the captain's wife, daughter and drinking problem was cut, as was most of the main character introductions in the longer press conference. I think you'll agree that substituting FX for those story scenes really hurts the narrative of the movie. The people who are watching the WAR OF THE PLANETS version are looking at some rushed FX and not getting the story that TERRARIUM viewers better responded to. Anyway, my producer's rep, Darlene Cypser, sold TERRARIUM to Mainline/Lightning Ent. The people at Mainline had a brainstorm to change the title to WAR OF THE PLANETS, since the Steven Spielberg movie, WAR OF THE WORLDS was coming out. Once the movie had that title, Lionsgate bought it from Mainline/Lightning. porfle: Some extra special effects were added to the film free of charge by veterans of STAR TREK:VOYAGER and BABYLON 5. How did this come about? MIKE: Chuck Carter and Bart Anderson were in the audience, at the theatrical premiere. They got a hold of another artist, PJ Foley and invited me to lunch. They did 7 shots, including the moons over the ship shot, when the astronauts finally come out. porfle: All in all, did you accomplish what you set out to do in the making of TERRARIUM? MIKE: Yes and no. I think it's good that people don't realize that it's a dubbed movie. The sound editing was a success, even if it made the actors seem more cardboard. As I stated, there were things that should have been better, but I did finish a 16mm sci-fi feature. Good or bad, I'm grateful for the amazing exposure that it got. Like anything at this stage of my career, it was a learning experience. Thanks to Mike Conway for giving us the inside scoop on the making of TERRARIUM (aka WAR OF THE PLANETS). Stay tuned for part two, which will cover the making of Mike's action-packed follow-up, THE AWAKENING. Kick or Treat! Have a JET LI Halloween!